It had been a hot minute since I've posted a blog, the month of March was an absolute whirlwind for me emotionally and physically. But I am back now, feeling a little better and wanting to share recent work I am stoked about! So I’m sharing this sweet engagement session that I shot last month in downtown Vancouver at Officer’s Row. It’s got tons of old colonial looking houses there and a gorgeous open field with a little white gazebo. This was at the tail end of that FREAK winter storm so it was still in the 30s I believe, but these two toughed it out and braved the cold (for as long as they possibly could without wearing coats!) and we had such a fun session. 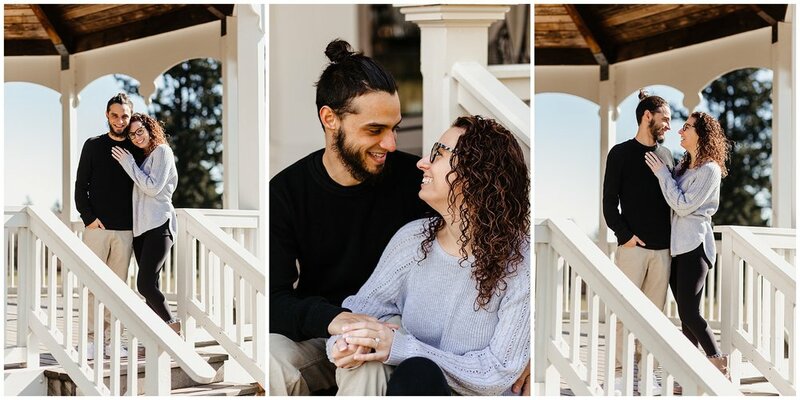 I am so excited for their little courthouse wedding in May! Also, let me know in the comments what you think of the mirror photo - I’m always trying to come up with unqiue, artistic photos to include in my couple sessions. I found this one at target in the dollar section, but I found another one at Michael’s that is really similar. I just use mine as home décor when I’m not taking it with me to a shoot! Looking for an engagement photographer? Or maybe just needing some updated photos with your sweetheart? Let’s chat and get you on my calendar! **side note** This is my first post using BlogStomp and my mind is absolutely blown at how fast it is, I’m never going back, thank you for coming to my tedtalk.